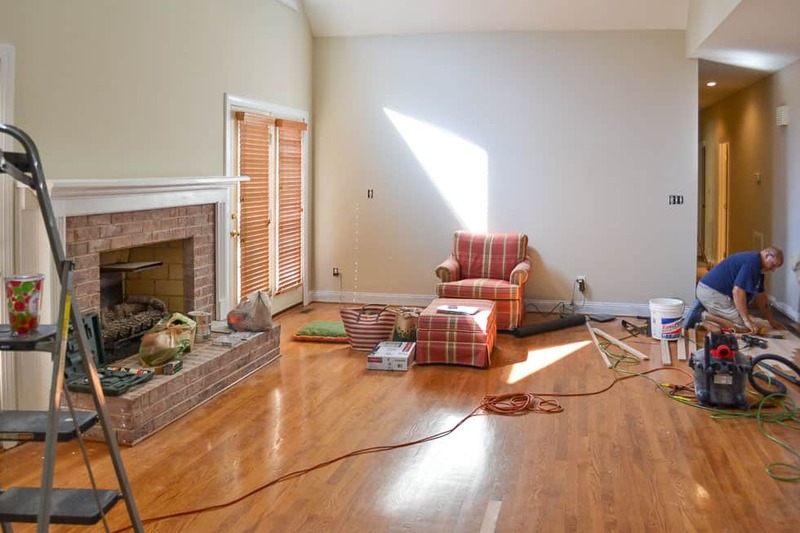 Wow – our family room has seen some major changes in the 2½ years that we’ve owned this house! 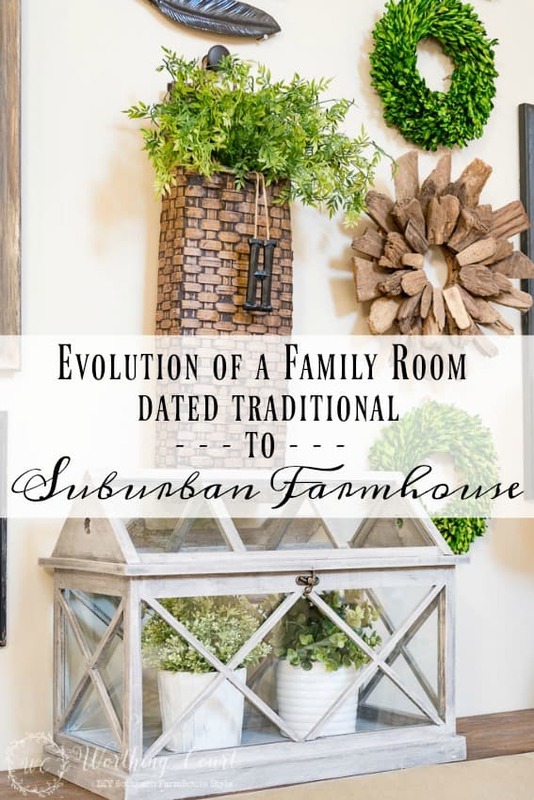 Bit by bit, we turned the former owner’s very traditionally decorated space into a suburban farmhouse style room. 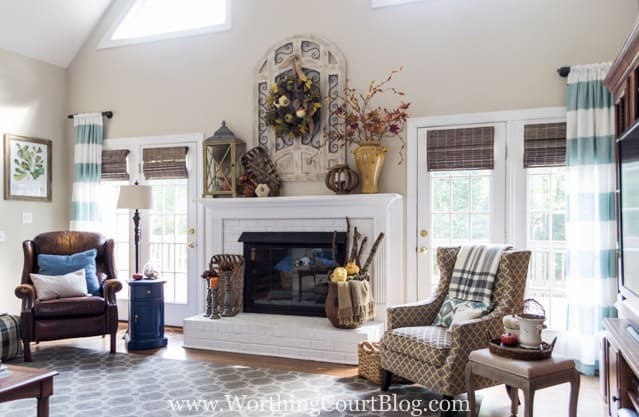 For this week’s edition of The Best Of Worthing Court, let’s take a look back at the evolution of this room. 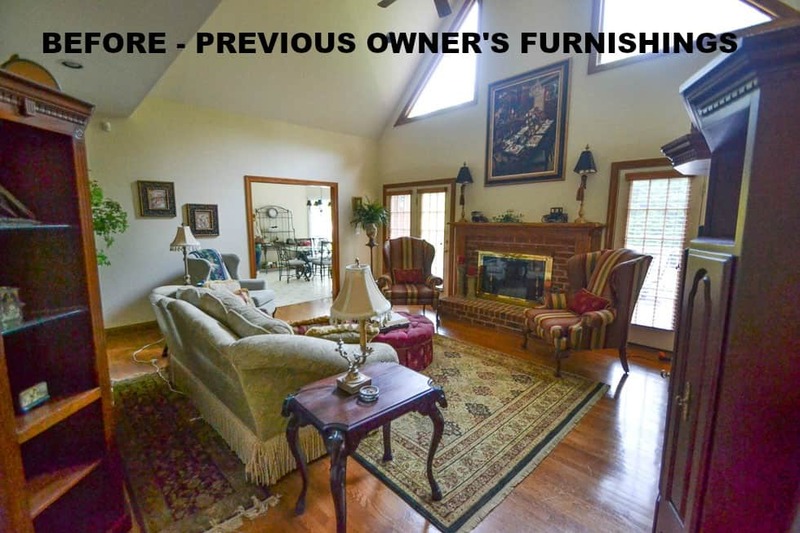 In addition to refinishing the hardwood floors, we enlarged the opening between the kitchen and family room, painted the entire room (including the trim), painted the fireplace and fireplace screen and replaced the old ineffective ceiling fan with a great chandelier. Oh yeah – we also replaced all of the pink recessed light bulbs, with regular ones. A minor change, but you wouldn’t believe the difference it makes in here when the lights are on! I’ve made a couple of changes since I first shared this space, like replacing the chair to the right of the fireplace and adding a new table, but other than that, everything still looks the same. 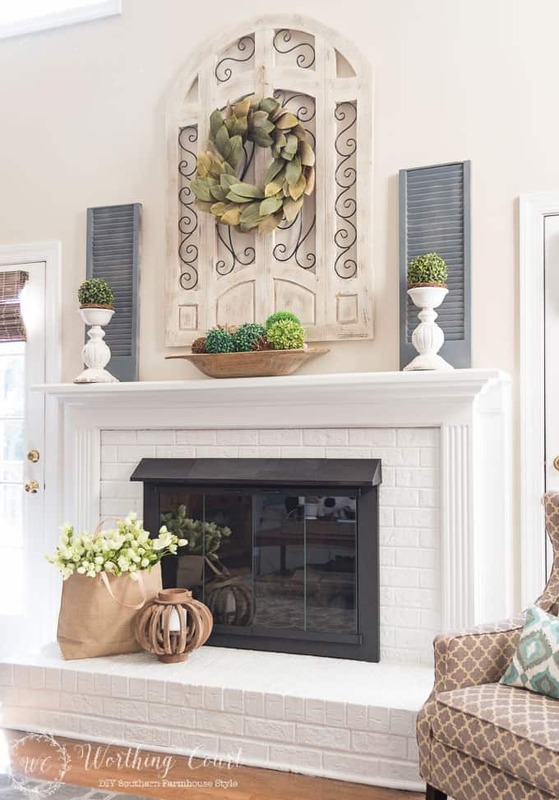 I’ve loved the arched wood and metal piece that I hung above the mantel. It makes a great backdrop for anything that I hang on it and it helps to fill the height of this wall. I purchased it a Kirkland’s, but it was a little too yellow, so I dry-brushed it with a little cream paint and swiped some gray paint over that. It’s currently available on the Kirkland’s website in a mahogany finish, but you could easily paint it to be any color that you like. They don’t carry it in my store, so I had to order it, but it was free shipping to their store. This is one of the most asked about pieces in my home! Click HERE for the direct link to it (affiliate link – see my full disclosure HERE). What an amazing change! Your furnishings look gorgeous and it looks like such a light and bright space. 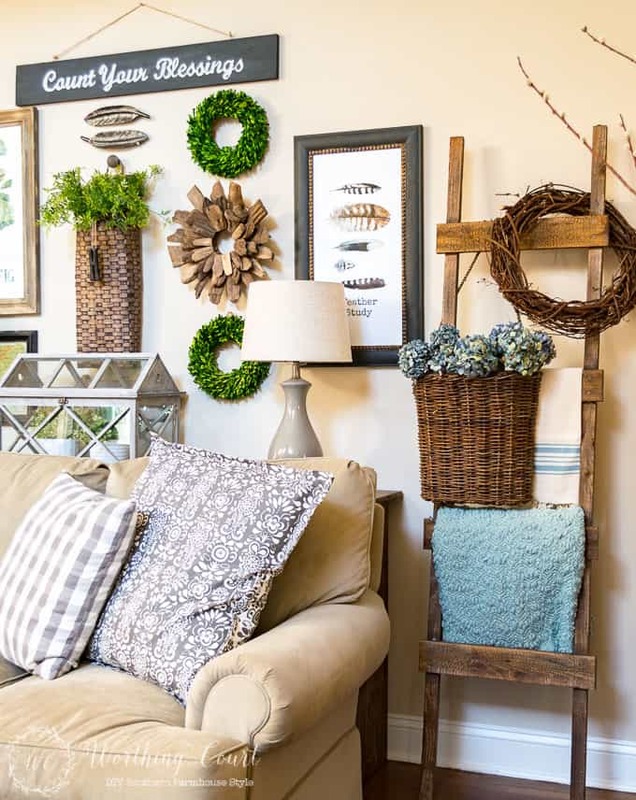 I love all the little details you’ve put into your wall decor and mantle. Where did you get your magnolia wreath? I’m on the hunt for one. Hi Nancy. I purchased my magnolia wreath on the Magnolia Market website. Here’s a link to it: http://bit.ly/2nRBWAI . Their wreaths aren’t inexpensive, but I thought they have the best and most realistic looking ones that I’ve seen. Beautiful, Suzy! I am amazed at all the changes and how cozy your home is! I can’t wait to visit and see it in person! So light and airy!!!!!! Comfortable! Kudos! You are so inspirational, love your ideas. Thanks for sharing! What a transformation? You have great vision! So light and cheery now! It seems to open the room. Love it! Suzy, a beaitiful transformation! My daughter is moving next week and looking for inspiration. I sent her your link. Your space is so similar to her new family room. Thaks for sharing. Suzy Where did you get the glass, planter thing (totally having mind blank) on your top image. It’s like a garden house planter? I think I have seen them…somewhere. love ! love all your hard work. Love your style beautiful remodel. I always enjoy your tours! 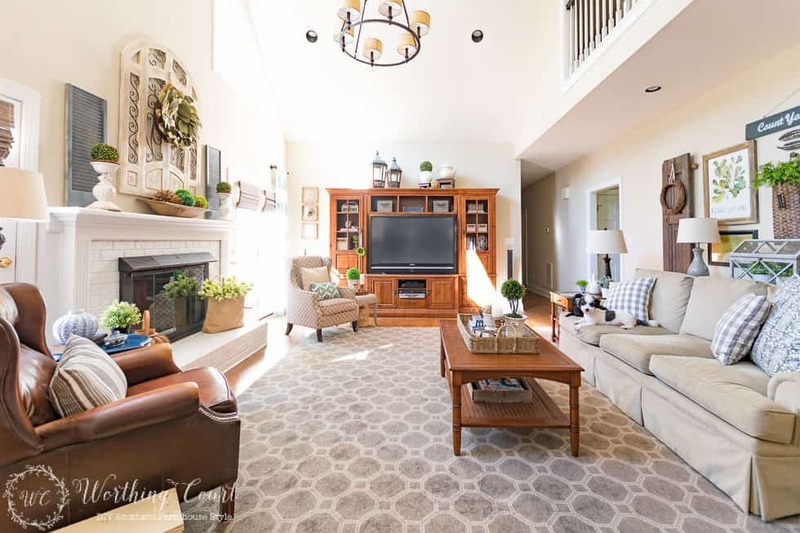 Although my house would fit inside your family room, I get so many ideas for our home from the beautiful spaces you create! Beautiful! It looks like a different house after your remodel! I can’t imagine the pink carpet – yikes! looks great. I really like your blend of colors. 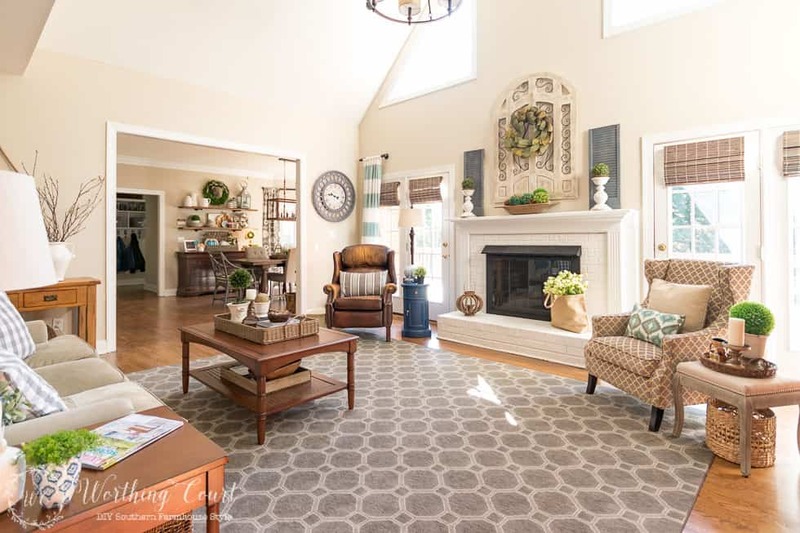 Where did you find your area rug in your great room? It’s very pretty! I believe I could sit down in the chair and actually take a calming breath! What a wonderful room to live in!! Thank you so much for allowing me to see your home! Your room looks beautiful. I like what you did with the curtains. I also like your Magnolia wreath and am anxious to order mine. 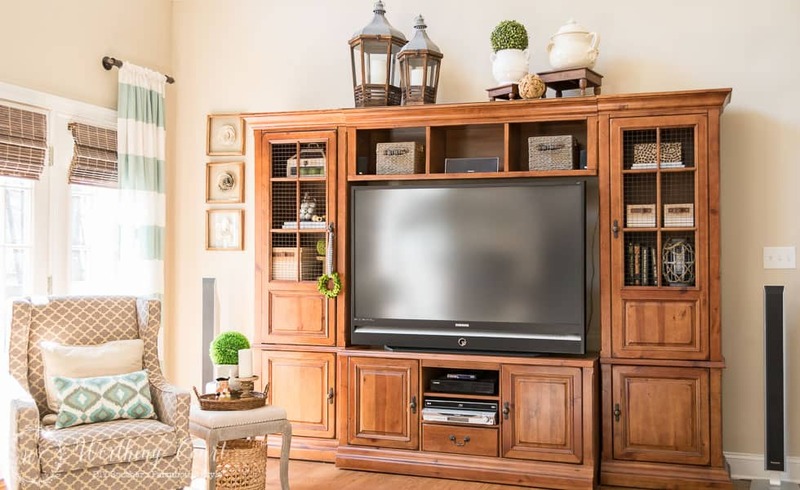 Where do you sit to watch television? It looks like it would not work at all. There is also too much shotsky dust collectors in the room. Our furniture arrangement for tv watching works great! I sit on the end of the sofa, closest to the tv and my husband sits in the leather chair to the left of the fireplace. I’m sorry that you don’t care for the room, but it suits our taste very well and we love it! Love the terrarium. I will be on the hunt to find one. Thanks for the inspiration. 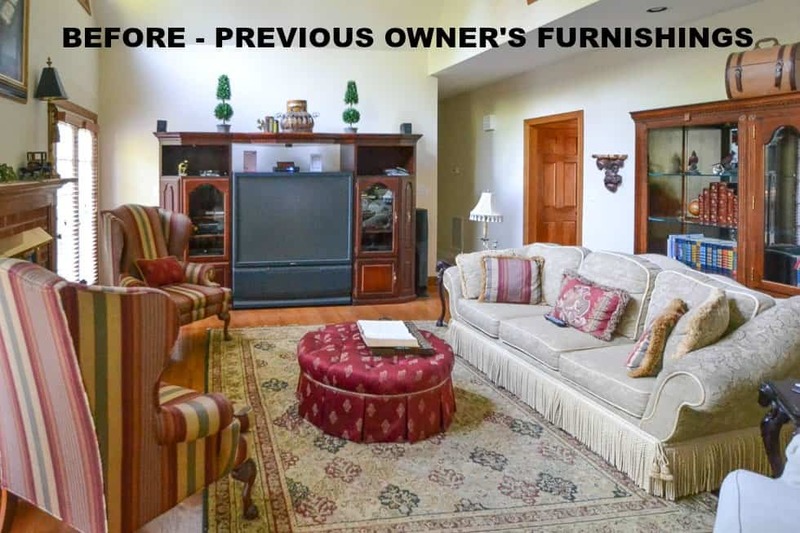 I, too, am wondering if you move the chairs around to watch television. 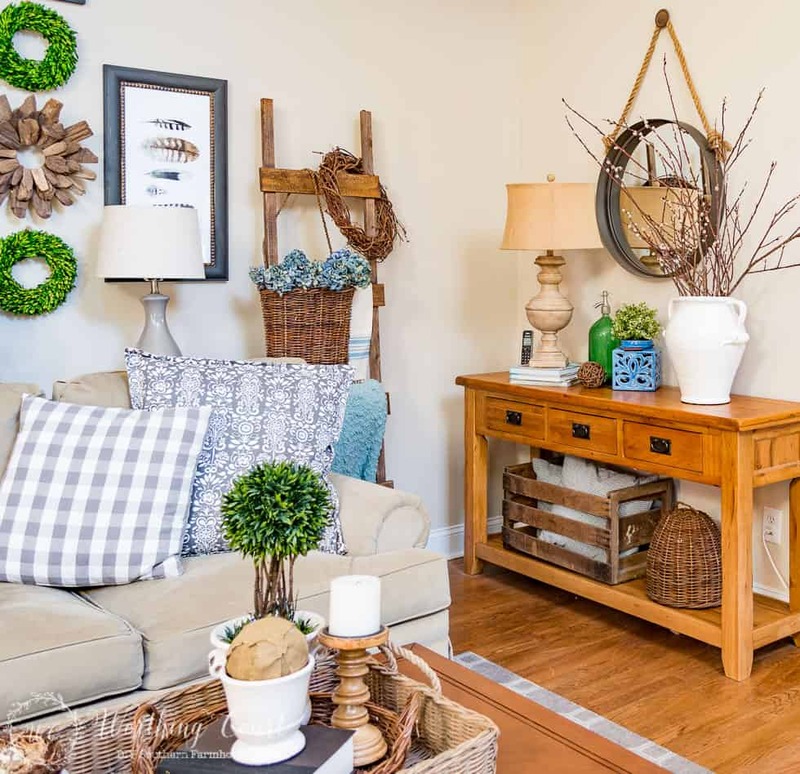 Your transformations really have brought the family room up to date and match your update farmhouse design. Hi Cher. 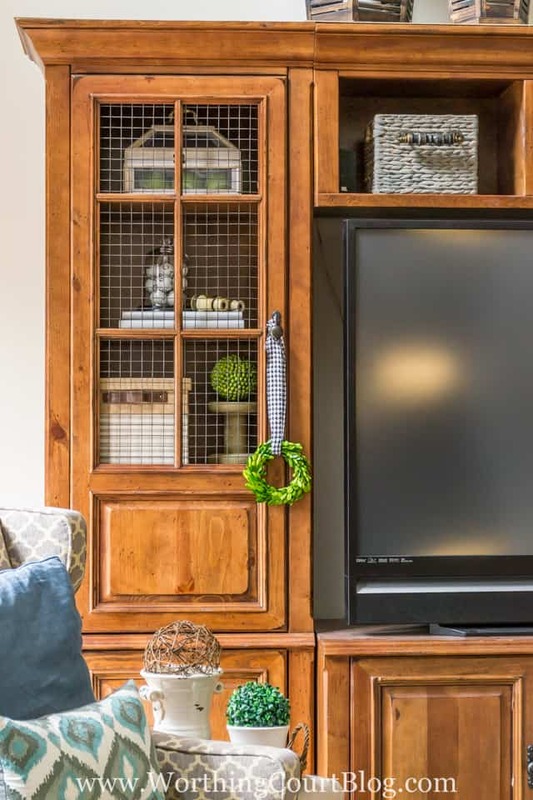 No, we don’t have to move the chairs around to watch tv – our furniture arrangement works great. I sit at the end of the sofa, closest to the tv and my husband sits in the leather chair, to the left of the fireplace. It would be way to much trouble to move the furniture around, so I wouldn’t have arranged the room the way it is if I had to do that. Maybe it appears that way because the picture of the room, looking straight at the tv, was taken with a wide angle lens so that I could capture the entire width of the room. Those lenses can make things look a little out of proportion, which is why I don’t use it very often. Thank you for the walk-through of your home. It is really lovely. What a beautiful transformation,I love it. So many great tips! Thank you for sharing. I love your blinds, but how did you choose that color? 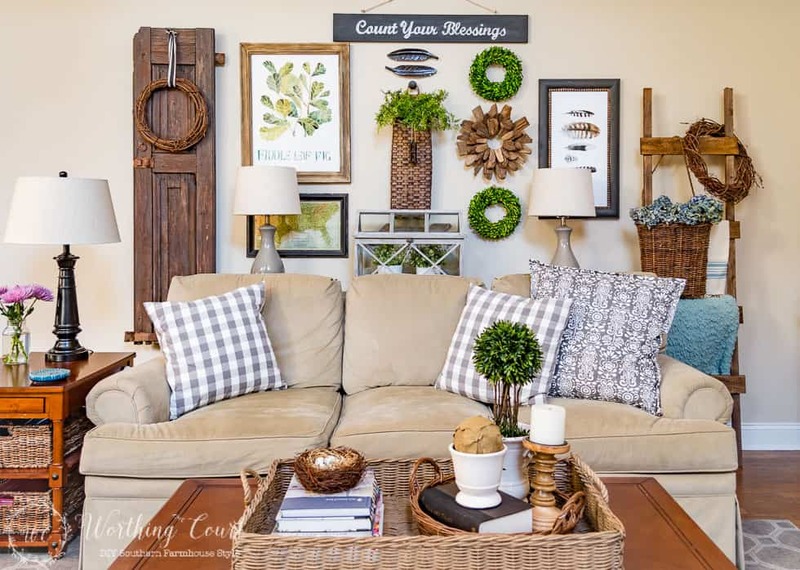 Everything blends so well in your home! Hi Andrea. 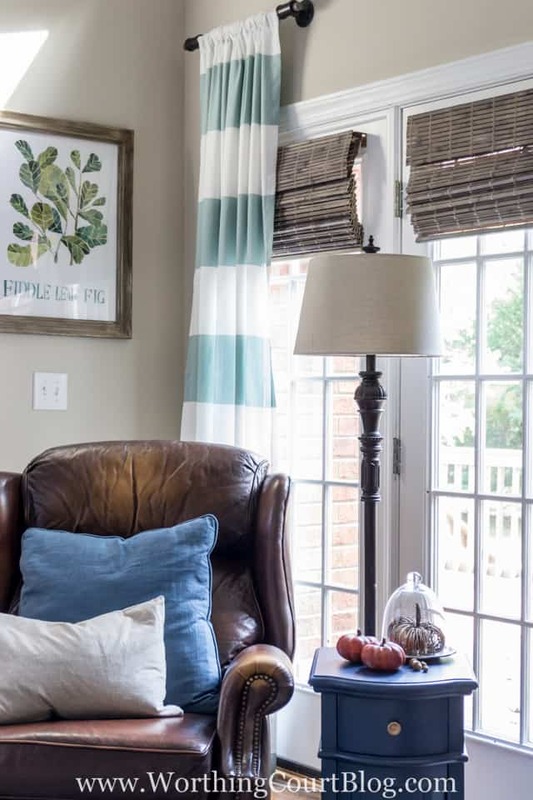 I wanted a color that I thought would flow well with the rest of my room, so when I went to purchase my blinds, I intended to just get some shade of brown ones, but when I saw these in the driftwood finish I thought they looked great and fell in love with them!